even with social activism on the increase, there are cases of powerful industry managing to circumvent rules and bypass procedures to ensure their units get governmental approval to function, regardless of their polluting and degrading natures. An example is Meta Strips Limited (msl), a copper recycling plant, which has got the church, environmentalists and the one million-odd citizens of Goa training their guns on them. The Rs 250-crore plant, owned by Sushil Khaitan and promoted by the house of Jindals, with a capacity to make 30,000 tonnes per annum of copper alloy is located in Sancole, south Goa. Copper and brass scrap, wires, cathodes, briquettes and zinc ingots are the basic raw materials, to be imported mainly from usa, Japan and Europe. Environmentalists contend that these inputs fall under the Hazardous Wastes Rules, 1989. "They also flout provisions under the Basel Convention on Trans-boundary Movement of Hazardous Wastes," says Antony Simoes of the Goa Foundation, a non-governmental organisation (ngo). The plant is 100 per cent export-oriented. According to B Vinaya Rao, engineer (operations and maintenance), the raw material - comprising 99.9 per cent pure copper - is stripped of the polyvinyl chloride (pvc) coating, melted in an induction furnace and cast into slabs. The slabs are annealed, pickled and degreased, cut to the required size, packed and then exported. The pvc waste - some 18,000 tonnes per year according to Goa Foundation - will be sold to the Indian market. Flawed process The project started off on the wrong foot as the plant process itself is flawed, say experts. "The production process to be used by the industry is outdated (pre-1950s) and energy-guzzling. The rate of raw material utilisation is low and the un-utilised material ends up as air and water pollutants," says a November 1999 National Environmental Engineering Research Institute (neeri) report by its director Purushottam Khanna. Possible air emissions include dioxins, mercury and zinc, while liquid effluents may contain copper, lead, cadmium, zinc, arsenic and mercury - all heavy metals. The solid wastes are likely to contain toxic heavy metals warranting the installation of a secure landfill for safe disposal, the report notes. However, says Simoes, "There is no hazardous waste dumping sites in Goa. The soil here is permeable and in course of time the toxins that will be produced will leach and contaminate the groundwater." Ironically, the Environment Impact Assessment (eia) report itself was drafted much after the plant was given the green signal and construction had begun. Using the state's Right to Information Act, 1998, experts managed to ferret out information about the project and began spreading awareness among the people. When the people started questioning the project, it was then that the eia was made. According to Debi Goenka of the Bombay Environment Action Group, Mumbai, "The eia has not been prepared as per the prescribed format, nor have they submitted the report for consideration to mef. Furthermore, the eia has to be prepared using data for an entire year. In the case of msl , meteorological data and water sampling has been carried out during January/February only and, therefore, do not reflect the scenario round the year. Obviously, the air impact assessment and the water impact assessments are flawed," says Goenka. Besides misleading information, there are a lot of discrepancies in the company's project report made by mecon (Metallurgical and Engineering Consultants) and the eia conducted by Swiss-based sgs (Societe General de Surveillance consultants), says Simoes. "It has already been four years since the project was conceived. From 1996 till today, there have been numerous inventions, new technologies and manufacturing processes in the field. Accordingly, we have updated our technologies. This is the reason for the difference in the two reports," counters Parikh. A top-down approach Ironically, the Goa State Pollution Control Board (gspcb) gave the 'no objection certificate' (noc) for water and air to the company prior to it having conducted an eia. Says Joe D'Souza, microbiologist at the Goa University, "The gspcb should have given noc prior to setting up the plant. In the case of msl , nothing was verified. The fact is there are no pollution experts in gspcb, so where does the question of checking air and water pollution arise? Their approval is totally bogus." If one goes by rules and regulations, a company's application to set up a plant is followed by an eia report. The report is passed on to the pollution control board concerned, which then calls a public debate. Thereafter, a noc is issued. It is only then that the company can begin construction. In the case of msl , it was a 'top-down' hierarchy approach. Says Parikh, "It is not our fault that the administration here is top-down. Bureaucrats never take any decision. In Goa, you have to approach the ministers for everything." "Since msl required to go through an environmental clearance process, a public hearing has to be held. But no such thing was held. The construction of the plant without complying with the environmental clearance process is also a violation of the Environment Protection Act and Environment Protection Rules," says Sagar Dhara, director, Cerana Foundation, Hyderabad, who studied the eia report. How the plant came to be located in Sangole is a story in itself. 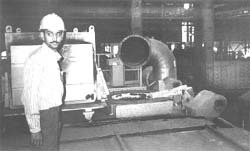 According to Jos, Khaitan was to initially set up the plant in Kandla, Gujarat. Though they were given an 'in principle' sanction, the project fell through because the Gujarat government had taken a decision not to allow scrap import. Then on August 15, 1996, the Goa government advertised for industrialists with "non-polluting technologies" to come to the state. Meta Strips responded immediately. The plant was initially planned for Verna Industrial Estate but pharmaceutical units located at Verna, led by Hoechst, revolted against the scrap-based project in their vicinity. "Hoechst threatened to pull out from Goa if the government insisted to foist msl in Verna. This forced the government to look for an alternate site," says Jos. The government acquired land in Sancoale by invoking the urgency clause under Section 1 and 4 of Land Acquisition Act on October 3, 1997, and handed over the land to msl on January 20, 1998. Experts contend that if the plant is non-polluting, why should it shift from Verna to Sancoale. "There is logic in saying that the plant should be located near any human habitation, and all the more so when the people there have objections," says Dhara. "They have procured 241,965 square metres of land at a paltry Rs 74,000 a year lease. Further, they have designated horticultural land as industrial," says Simoes. Simoes, however, believes that Khaitan's men have "taken care" of the top officials, which he calls a "corrupt form of pollution". "The company's mode of thinking is let someone else pay the cost, we will have the benefit and the government is only helping them reach their goals," he says.